Understanding resonance structures is the first step. Knowing which electrons CAN and CAN’T is key to figuring out how to draw additional resonance structures. This video shows you what to avoid when drawing resonance, followed by key arrow patterns to look out for in determining additional structures. <– Watch Previous Video: What is Resonance? 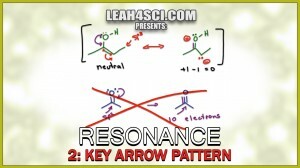 This is Video 2 in the Resonance Structures Video Series. Click HERE for the entire series. Don’t miss the Written Tutorial Formal Charge Formula and Shortcut for Organic Chemistry that is also apart of the Resonance Series.